A dredging boat moored near Scunthorpe and attacked by vandals who smashed lights and temperature gauges, is now being protected by a GSM based intrusion detection system using an OPTEX outdoor sensor and linked to an alarm receiving centre (ARC). 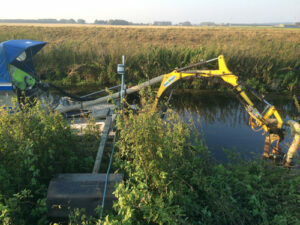 Ebsford Environmental was working to remove silt along the Bottesford Beck tributary that feeds into the River Trent for four weeks as a flood prevention measure. While the dredging boat was moored overnight, the vessel was vandalised, and although it did not stop the team from finishing the job, it was both time consuming and costly to repair. Dean Bolton, Managing Director at Eyewatch Security, was approached by Ebsford Environmental and recommended a VX402 GSM system that comprises an OPTEX outdoor PIR incorporating a GSM transmission module developed by TAD Electronics, monitored remotely at Eyewatch’s ARC.